We want to test your Nocardia! Aquafix is currently conducting testing to improve Nocardia treatments, and we would like to include your sample and solve your foaming issues at the same time! Click on the link below or call us at 888.757.9577 to learn more about sending in your sample. Problem: High levels of Nocardioforms causing foaming in activated sludge systems and in sequencing batch reactors. Cause: Wastewater plants receiving high levels of fats, oils and greases, and/or high sludge age conditions. Its also believed that different types of surfactants (soaps) can result in the formation of Nocardioforms. Solution: We recommend wasting 20-30% of total solids in mixed liquor. This should be followed up by the addition of Qwik-Zyme L at the head of the wastewater treatment system, and Foam Buster added to the head of the plant or into the problem aeration basin. Mechanical removal of foam is also highly beneficial but is difficult in most cases. 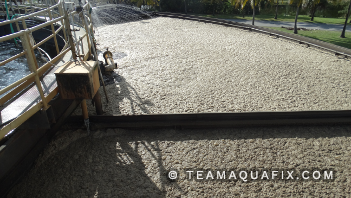 In small amounts, Nocardia is quite beneficial for the wastewater system as it adds stability to the floc structure and keeps it from breaking up or shearing. In large amounts, however, these branching bacteria can wreak havoc. Nocardia is an opportunist and succeed when the health of naturally-occurring bacteria is vulnerable. Once it gains a foothold, it can take over your system causing poor settling and major foaming. Nocardioforms, commonly referred to as Nocardia, are a category of Gram positive branched filamentous bacteria. Nocardioforms often contain Neisser positive granules but a Neisser stain is not necessary for identification. These filaments are relatively slow growing and are present in most wastewater systems. Nocardioforms are unrecognizable for most of their growth period and become distinctive once their branched structure becomes visible. Nocardioforms use fats, oils, and greases to produce a low-density fatty cell wall which causes them to float. In aerobic conditions they also generate biosurfactants to help them stay suspended at the surface of a wastewater system. When high levels of Nocardioforms are present, a web-like structure is formed due to their branching; this leads to the formation of a very stable foam. Once Nocardioforms become branched in a system, they are often quite difficult to get rid of. In addition to foaming, Nocardioforms can cause bulking and high effluent total suspended solids (TSS). Nocardioforms uptake high levels of BOD very quickly, which can begin to starve floc forming bacteria and encourage the growth of Low F:M filaments. In some cases, this high BOD uptake rate can lead to quick treatment of high strength waste. 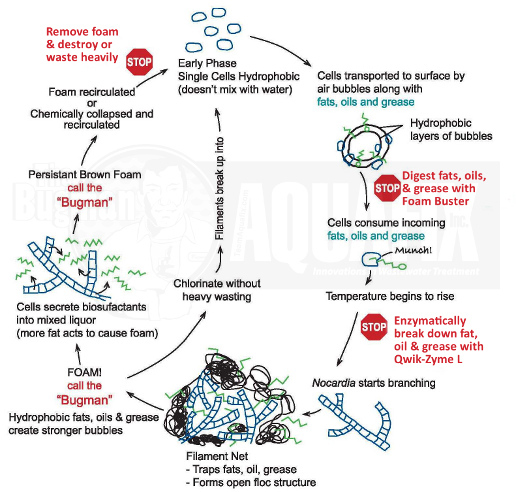 Brown foam is caused by undigested nutrients rising to the surface from the mixed liquor. Brown persistent foam indicates a problem in the system, but does NOT mean the Nocardia is the culprit. A distinguishing indication of Nocardia-caused foaming in very low efficient BOD levels. Caution: Chlorination is a poor choice to treat Nocardioforms, as chlorine needs to remain in contact with a target for a period of time. When chlorine comes into contact with Nocardioforms, they fragment and disperse throughout a wastewater system which prevents toxicity to the Nocardioforms. 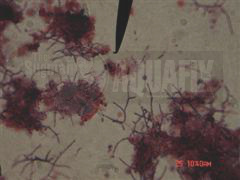 These fragments will immediately regrow after the chlorine has been diluted in the wastewater system, and this often increases the population of Nocardioforms in the long run. Chlorination can also knock out the nitrifiers. Optional: A Bug on a Rope helps to begin the degradation of fats, oils and greases earlier, when added to upstream lift stations. Wasting solids helps to remove Nocardioforms, and encourages the growth of new biomass. This action results in a decrease in sludge age, and makes it easier to stimulate growth of desirable floc forming bacteria. Qwik-Zyme L breaks down larger fats into smaller fatty acids which are more easily degraded by floc forming bacteria. This helps floc formers better compete with Nocardioforms when degrading fats, oils and greases. Foam Buster provides a blend of proteins, amino acids and micronutrients, which enable floc formers to more effectively degrade fatty acids. After increased wasting, it may take some time for your wastewater system to recover its biomass. In these cases, we sometimes recommend our VitaStim Rebuild or our SmartBOD. Jenkins, D., Richard, M. G., and Daigger, G. T.. Manual on the Causes and Control of Activated Sludge Bulking, Foaming and other Solids Separation Problems 3rd Edition. London: IWA Publishing. 01 Sep 2003. “Antifoam What Is It?” D-Foam Incorporated. October 2009.